Donating your hair is a wonderful way to support a charity without spending money. You simply grow out your hair. Then either donate the hair to charity directly or sell the hair for cash and donate the cash to whoever you wish! Here's how! One of the best known charity organizations that handles hair donations is Locks of Love. Locks of Love is primarily geared towards helping people with alopecia areata - a medical condition which causes hair loss and which cannot be cured. The wigs made from hair donations are given primarily to children and are provided free of charge. A wonderful foundation. I have personally donated hair to Locks of Love several times and have been quite pleased with the process! Where Locks of Love focuses on alopecia areata, Pantene Beautiful Lengths focuses on hair loss due to cancer. The hair that you donate goes towards creating wigs for people who have lost their hair due to cancer and chemotherapy. Another wonderful cause to support, and it's so easy! You just grow out your hair, cut it off when it gets to the proper length, and mail it in! It's free, and it's a fantastic way to support people in need. 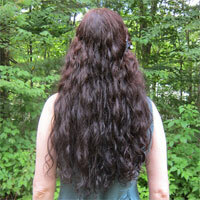 Again I have personally sent hair to Pantene and have been pleased by this process. The Wigs for Kids charity is all about children. It helps children who have lost their hair for any reason regain their self esteem. I've never personally donated to Wigs for Kids, so if anyone out there has done so, please contact me and let me know how it went! This method is a little more work but if you have a charity you want to support that's not on the above list, this is the way to go! Say you want to support the ASPCA or Red Cross or other group which doesn't have a hair donation policy. What you'd do is list your hair on your own website, on a forum about hair, or a forum about charity. Show photos of your hair from various angles and list the price you'd like to get for it. You would arrange for the transaction with the buyer through PayPal usually so that both people have buyer protection. A critical part of doing this kind of hair donation is that you want to document every step. Usually the buyer wants to see photos of you getting the hair cut in a salon so they know it's really you and that it was done recently. When you get the PayPal payment from the buyer, you're ready to start. You head off to the hair salon. When the hair is cut it is first braided and a pony tail holder is put on each end of the braid. That way when the hair is cut it doesn't unravel into a giant mess :) You then put the braid into a zip lock bag to keep it safe. You send photos to the buyer so they know the status. Then you mail out the hair with a signed receipt option and tracking option so you know that it was delivered and received. You can now donate that money you received to whatever charity you wish! Often people are willing to pay more for hair if they know it's for a good cause. It all depends on how long you want to grow it, and how well you take care of it. It's well worth the time spent on caring for your hair and health! Here are two examples of hair sales! Lisa's hair is currently 2 feet long and is auburn in color. It naturally curls into long spirals. Lisa will be donating 100% of the money paid for this hair to the charity chosen by the buyer from a list of five options. 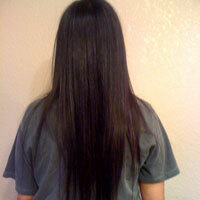 Jill's hair is 17 inches long and is dark brown in color. She lives a healthy, active lifestyle, eating organic foods much of the time.